The Kensington Training School for Girls (occasionally referred to as the Kensington Girls' Industrial School) was founded in 1858 at 3 Church Street (now Old Church Street), Kensington. Its stated object was to provide a home and industrial training, 'with such education as may fit them for domestic service,' for girls who, from 'evil example, extreme poverty, or death of parents, are exposed to temptation,' from 12 to 15 years of age. 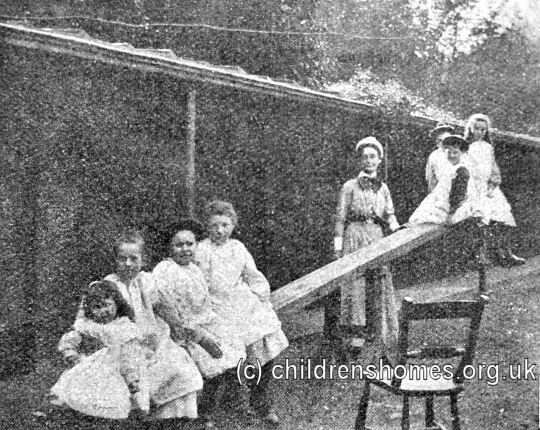 Girls were required to stay at the home for at least two years, and could not leave the School until reaching the age of 16. A payment required, in advance, of 3s. 6d. a week for girls living in St. Mary Abbots parish, 5s. 6d. a week for those from elsewhere, together with entrance fee of £1. 1s. A medical certificate as to general good health was required. The girls were eventually placed out in service, in situations chosen by the Home's Committee. 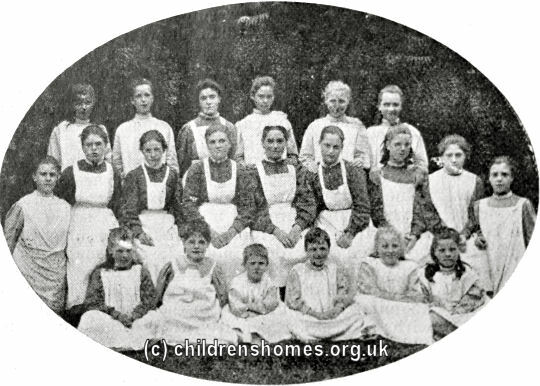 To prepare them for this, the girls were trained in matters such as cookery, needlework and laundry work. 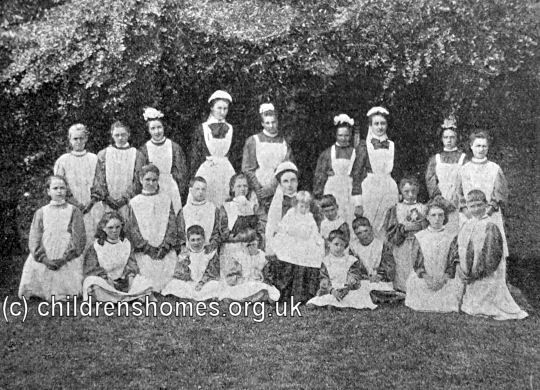 In 1899, the Home was taken over by the Waifs and Strays Society and continued to operate along its existing lines, accommodating 20 girls aged 10 to 16. The girls attended a local school during the week and on Saturday morning mended clothing. They were each given a small patch of the Home's garden to cultivate. Here is an account of the Home's daily routine from 1902. At 6.00 the first bell rings, and all the "tinies" get up, have a cold bath and dress. At 6.30, second bell, work for all; preparation for breakfast, boot cleaning, sweeping dormitories, doing bedrooms and sitting-rooms, and all that is necessary to keep a house clean and neat. One small nurse superintendents the toilet of the little ones, while another has entire charge of "baby". At 7.20, boot bell — each girl now changes her house slippers for boots ready for the day. At 7.30, breakfast — porridge three times a week, and bread and dripping and bread and treacle on other days, with tea for the elder girls and milk for younger. After breakfast come prayers, and then all go up to the dormitories and each child's makes her own bed. Now the laundry girls disappear to their lair at the bottom of the garden , and the cook and maid to the kitchen, while the housework is finished off by the school children. who rub up the polished floors of the dormitories, put on quilts, etc., till a quarter to nine, when off they go to school with a cheery "goodbye", Matron. In addition to the washing for the Home, our girls do the surplices for St Mary Abbots and Christ Church, beside their altar linen, and the new work for the St Mary Abbots Church-work Guild, and we get a very good character for "colour" and "finishing". This brought us in last year the satisfactory return of £50. Dinner is at 12.30, and we always have pudding as well as meat or soup. Now a walk for the school children till 1.45, when they must again be in school. Tea at 5, when the events of the day are discussed; then recreation for house girls, and after short preparation of school lessons, also for the children. At 6.20 "boots" again, followed by prayers. Now comes bed for the little ones, while the kitchens, school room, etc., are scrubbed by the elder girls; but we are early people, and soon after 8 o'clock silence reigns, and our little family is off to the Land of Nod. Saturday is a little different, as there is no school. All sitting rooms and bedrooms are thoroughly "turned out," and then comes "Work Class," at which every child, no matter her size, mends her own clothing. 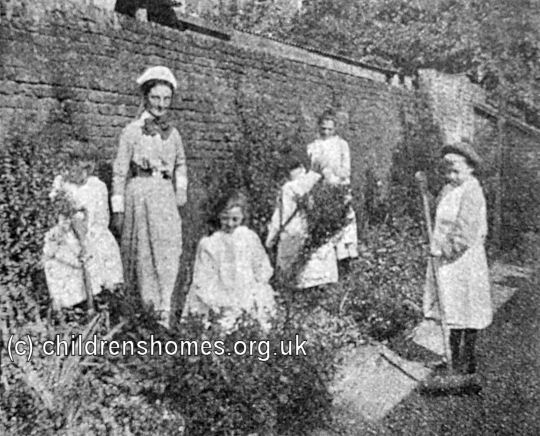 All afternoon is devoted to a walk, and many a jolly game in beautiful Kensington Gardens, and in Spring and Summer, especially, the children devote much of their spare time to gardening, for everyone has a little garden of their own. This is, perhaps, unique among London Homes. After tea, on Saturday, comes "Marks," a most important function, when Matron counts up and sees how every girl has been doing during the week, and on this hangs "Mark Money". Every two or three months we have a grand change round of work, so no one gets "stale" and each girl in turn has practice in the different kinds of work. Of course the posts of cook and maid are the most responsible and most to be desired, and it is nice to see what useful little cooks and handy waiting-maids even girls of fourteen can become. The Home closed in 1910. The girls were housed temporarily at West Norwood then dispersed to other homes. The Church Street premises no longer exist.